Yet another brilliant piece of kit from Enterprise. This solves, very effectively, the need to attach beta type lights to your rod top without glue, whipping, and varnish. 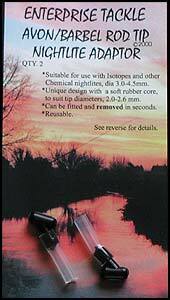 Sold as a pair, to suit different diameter rod tops, they are ideal for the current trend of Avon/Quiver conbinations. I’ll attempt to describe them. It consists of two halves of a smoothly finished plastic body, the inner being made from a softer material, which fits round the rod top. These being held together by a short lenght of silicone tube. The betalight, or starlite, is then pushed into the other end of this tube. 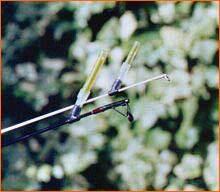 The two sizes, enable most modern Avon type tips, and quiver tops to be adapted for night use, easily and securely. Each can be removed in seconds, although I like to keep them on without the beta’s in, as the short length of silicone gives me more to focus on. I have mine high up near the tip ring and have never had a tangle during use, even with braid mainlines. To avoid eye strain two can be fitted to the same rod, helping the eye to compare on ligh with the ther making small twiches easier to spot.